The government says that the Klang Valley Mass Rapid Transit Line 3 (MRT3), which was initially announced as having been scrapped, has merely been postponed. This was revealed by transport minister Anthony Loke, who said that the decision to put aside the rail project for now was to reduce the burden of the government’s debt. 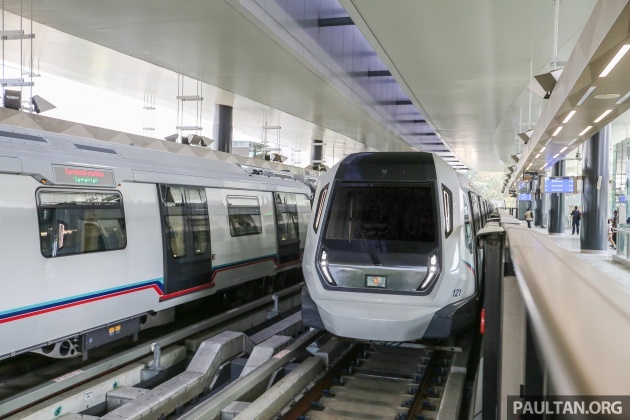 He said that major projects such as the MRT3 will be given priority if the country’s financial position was recovering, adding that the cabinet will determine when construction will resume, Bernama reports. “Any such big decision needs to get the Cabinet’s approval. At present, the government’s priority is to reduce the rate of national debt first but for crucial projects like MRT3, when the country’s financial status recovers, it will certainly be given priority to be reviewed,” he said at the Dewan Rakyat. He was replying to a question from Khairy Jamaluddin (BN-Rembau), who asked about the rationale and implication of the scrapping of public transport projects such as the MRT3. Loke said that the government did not deny that MRT3 would bring various benefits, but its implementation should be reviewed for optimum results in view of the excessively high national debt at present. “As the MRT3 line passes through urban centres with high density, almost 80% of the line is underground, which contributes to the costly construction cost that is expected to reach RM50 billion,” Loke said. Also known as the MRT Circle Line, the fully automated and driverless rail system extension was to have formed the loop line of the Greater KL/Klang Valley integrated transit system. Originally targeted for completion by 2025, the 40 km-long MRT3 was meant to provide coverage in areas surrounding Bandar Malaysia, Ampang, KL Ecocity, Bukit Kiara and Sentul. Loke said that the government’s priority is to get more people to use the MRT Sungai Buloh-Kajang (SBK) Line as well as the feeder bus service. He said that from January to May this year, the average daily ridership on the MRT was 146,842 commuters, which meant that only one-third of the 450,000 capacity was being utilised. He added that the government is continuing to look into the introduction of a RM100 monthly public transportation pass, a pledge it made in its GE14 election manifesto. Loke said the implications of the move are currently being studied from a financial point of view. If approved by the cabinet, he said it could be introduced early next year, thereby encouraging more to use the MRT. Loke said that the government will also prioritise the overhaul of the country’s bus network as well as improving the KTM Komuter system in the Klang Valley via upgrading and repairing works on the railway structure. “The postponement of the MRT3 project gives us the opportunity to review our budget priority, in which the government will give new focus on improving bus services and infrastructure development not only in the Klang Valley but throughout Malaysia in line with the government’s manifesto to improve the quality and coverage of public transport service,” he said. Yes better to postpone it until we clean the previous dirt up. Like moving to a new house. You cannot put in new furniture unless you clean all the old dirt and grime from the floor first. on may 30th 2018, tun mahathir already announced it was scrapped. you can find it on news portal everywhere. now suddently Loke said it has been postponed. Terima kasih PH kerajaan prihatin. Waiting for Uturn terms and conditions applies. Membaca itu jambatan ilmu. Terjah..
dude… we are discussing about MRT 3, not LRT 3.
why are you trying to change the topic? Suddenly postponed? After the cost down price up exercise and the huu haa it caused to the rakyat? When was this decision brought up to the rakyat for their opinion? This guy is not intelligent enough to become Transport minister at all. Already starting to Flip Flop now. His role is to make money for New Gov by coming out with ludicrous samans and funneling the proceeds of number plate auctions to New Gov instead of the needy NGOs. Yes..truely understand you. Summons are very unlawful and most important it is very fine with your for old masters whom you clearly worship to steal. Old masters deemed current samans alredi sufficient cuz following the laws, but Loki seeks to create new samans but based on no laws anywhere somemore thats his arbitrary decision, not even go thru Parlimen. Yes… unlawful indeed. Syabas YB Loke. Smart move to reduce the burden of paying off debts left by previous govt. Nothing wrong to postpone a project when U cannot afford one NOW. That is called financial management some called prudence. Please study the project thoroughly B4 implementing MRT line 3. Make sure its an Open tender too. Some just call it foolish becoz its gov responsibility to plan & carry out pipu oriented projeks like public transportation. The city & its transportation infra has grown to unsustainable levels via private modes and alredi we r losing billions on loss of productivity due to gridlock jams. If the previous gov can plan to mitigate this fate, then its foolish for New Gov to bury their heads in the sand. Talk is cheap when U are not in the Gomen of the day. Can U tell me why MRT is still losing millions after 1 yr of operation?? According to MRT corp, the current ridership is less than 150,000 daily. They said MRT need a daily ridership of 250,000 to get their return on capital. Maybe an extra 100,000 john’s to ride MRT will help!! Now I know why the previous Gomen fail & they FAILED Big Time. This show their planning did not match my/our expectation. Only fools like U believe a failed gomen. Yes, talk is cheap. Pls show me which public transport in THE WORLD thats affordable to the masses yet makes profits that it can be self-sustainable? I ask this from u previously but still waiting 4 ur answer. Satu pun sudah cukup. The previous gov belips in public transports but not u pipu. The previous gov failed becoz of fools like u who belips their own lies and fail-rytales. is done on an Open tender project. The problem is its overprice to begin with. If the project is cheaper, it can recoup the $$$/capital faster hence cheaper & more people will use. Did I say scrapped MRT or are U trying to put words here? I merely say Postpone & do a thorough study B4 an Open tender. The Gomen of the day can complete the project when they are on a better footing, financially. This MRT3 project can wait. Its not a zero sum game. We all want an efficient transport system not just in the klang valley but the whole of M’sia. One must know its own financial position B4 embarking on chasing all our “Wants”. Make our “Needs” the priority 1st & foremost. This is financial prudence 101. Yes..like those who bury their own head in the sand while your ex-pm steals from your pocket. Got such place call Bandar Malaysia ? New capital city? The redeveloped land at Sg Besi airport is Bandar MY lor. Yes, the one that 1MDB bought cheaply for under RM70 per sq ft from the Gomen. In the meanwhile they got money and susahkan rakyat with P1 2.0. Don’t talk ayam jantan. 1st time I agree with u.
do they have any intention to extended the current kajang mrt route to bangi, alam sari, bangi avenue and putra-mahkota area? these are all residency area, they need the most of public transport. So many ppl here confused with LRT3 and MRT3. Hahaha! Only cuz bashers din read the artikel b4 scroll down to furiously spew their venom. But speaking of LRT3, they might as well postpone it cuz their current plan for it totally sux! Better to wait 5 years later when New Gov Lagi Baharu takes over and implement LRT3 as it was originally envisioned. please raise toll rates and channel the money to LRT! Canot raise toll rates cuz alredi janji to abolish it. Only way to finance it is to issue banana money. ‘Scrap’ means ‘Postpone’ and vice versa with the new Government. Dear YB Anthony. Pls revive the KL-Klang BRT project. Since the construction cost is much cheaper than rail transit, previous Najib administration didnt find it useful to fill up their political funding pockets & hence cancelling them. Duhh! Previous gov didnt find it useful because they ady planned LRT3 (the full capability one, not the uppriced downsized one) to serve that function. That is why it was envisioned to have 6 car trainsets instead of being halved now.